Add cubed chicken and 1/2 cup franks red hot sauce to a bowl. Cover and place in refrigerator for 30 minutes. Remove from grill and place grilled chicken in a bowl, toss with 1/4 cup of buffalo sauce. 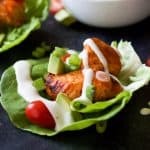 Assemble lettuce cups: place butter lettuce cups, 2-3 cubes of chicken, 2-3 diced tomatoes, 2-3 diced avocado, a pinch of green onions, and a drizzle of ranch dressing.